There are also some VERY provocative Weird Tales covers — I do know that risqué covers were fairly common in the ’50s — but I was rather surprised to see that equally bold material was being published in the ’30s. 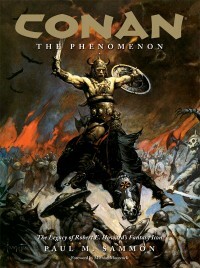 The lengthy and well-crafted foreword by Elric creator and Conan comics contributor, Michael Moorcock, offers many insights into the psyche of Robert E. Howard, and his most famous creation. Simply, Conan resonated with American readers because he was the embodiment of many American virtues, or at least, idealized virtues. A western, pioneering sensibility. The badass with morals, distrustful of monied nobility, and suspicious of unctuous prophets. As expected, and deservedly so, there is plenty of play given to Dark Horse’s publishing efforts. The publisher certainly deserves credit for keeping the torch lit for Conan, as well as other REH characters. As for igniting that torch — the credit goes to Marvel Comics, though I’m not convinced that it was necessary to cover their Conan years by starting from scratch, that is, from 1939, when it was known as Timely Comics. That said, Roy Thomas and Barry Windsor Smith are certainly given their due, with a number of Smith’s cover and interior reproductions included. I do feel that Big John Buscema was short-shrifted in comparison, even though he illustrated more images of Conan than any other artist before — or since. As noted, this book is thorough, so beyond the books, movies and comics, every vehicle to feature Conan in included (as far as I can tell), from video games, to action figures (though no pic of the classic Mego Conan — boo!). However, this is a trade paperback of a book originally published in 2007, and it has not been updated with new content — which is unfortunate, as some behind-the-scenes details would’ve been of keen interest to any fan (or hater) of the much maligned, and unsuccessful, 2011 Conan movie relaunch — as well as the upcoming return of Schwarzenegger to the role that made him famous. That said, there’s still lots to love, and at an MSRP of $19.99, you’ll get plenty of bang for your buck.